To borrow a line, Amit Trivedi is a full-time music composer and part-time singer who breathes music. His musical style is not hard to spot in any album he is involved with, each song having both the necessary feeling as well as the breathiness of the wind as it seems to flow by and be carried away. There is such ease to his music, that it instantly gets invited into one’s heart becoming another immortal tune in his burgeoning discography. His latest album is Andhadhun. The main character played by Ayushman Khurrana is a blind man who falls for Radikha Apte (and vice versa!) and is then witness to a tragic death with Tabu involved. So, in this album listeners are bound to find both the soft love songs, the mysterious tunes and something of a twist from the musical mind of a master. “Naina Da Kya Kasoor, ve kasoor, ve kasoor” is the ironic opening for Amit Trivedi singing Naina Da Kya Kasoor, the album’s opener. A slow opening with distorted guitar in combination with a strumming acoustic guitar and snare drum for beat make for a nice background sound. From the visuals, this is set in a light and airy bar with a piano for our piano playing blind man, and the song doesn’t deprecate from this. However, there are quite a lot of other instruments that don’t have any representation within the song and Ayushman keeps on playing when there clearly aren’t any piano parts. This song makes you want to get up and move; not all the way to dance but a slow, unchanging calypso beat give it a light but fun feel interspersed with some complex piano moves for a bit of show-off value. Later in the album there is an electronic version, simply known as Naina Da Kya Kasoor (Electronic). This one doesn’t look to change anything, just put a club beat to it. Unfortunately, as it doesn’t change the fundamental structure, the beat added seems separate from the original song, so it will be up to listeners to decide if its worth it. Abhijeet Shrivastava brings a softer version of the first song in Aap Se Milkar. A flute and bottle provide the background as they bounce off each other in another calypso feel song. Bass drum and a keyboard used to provide various synth sounds are well employed and a flourish of mandolin is added. Then Aakansha Sharma comes in towards the end for the lady’s perspective. While this is essentially a copy of the first song, it does feel a bit better as both singers are more suited to the mood of the song portrayed within the mixture of Hindi and English lyrics. Ayushman Khurrana takes the mic for the remake of this one known as Aap Se Milkar – Reprise. Amit Trivedi recognises that the lack of instruments means the melody can’t carry itself for long, so this one is 90 seconds shorter. The opening flute and bottle become flute and piano, which gives the flute more of a chance to flourish and Ayushman is well known for his singing capabilities, so this song also does quite well. Next is Arijit Singh to bring the vocals to the sensual feeling of piano, violins and accordion in Wo Ladki. It’s Arijit and a piano, a slow drum and accordion flourishes throughout, this is salsa and tango. Sudden shifts of speed and a Spanish feel for the chorus give it a very two-toned feel, all which Arijit simply takes under his wing and gets on with it. This one is an easy one for Arijit, considering some of the harder projects he has been taking on this year, and he shines in the way only he seems to be able to. One for the already in love, with just a little bit of spice to reinvigorate a dull moment. Lashings of Kishore Kumar’s ‘Meri Pyari Bindu’ come to mind during the next Amit Trivedi sung track Laila Laila. This is the song where everyone falls in love. An opening piano run that seems to test all the notes out (as if to prepare for later in the album) is taken over by an acoustic guitar holding this rhythm backed by a bass drum. Amit keeps it loud, but this is not really an openly dance song. A listener might be tempted to skip in the street thinking about a little flutter in the heart on a Sunday in the park or more specifically as the song says “Monday raat”. Shadab and Altamash Faridi provide both a regional and off beat comedy styling for the next song Oh Bhai Re. Very much a re-versioning of kDhaynchand’ from Manmarziyan, this song fulfils the same space and style, just with a change of language. The additions of harmonium, backed by synth sounds on the keyboard give it a different sound to the track in Manmarziyan, but its too easy for the listener to think back to the original song that its likely they only recently heard. 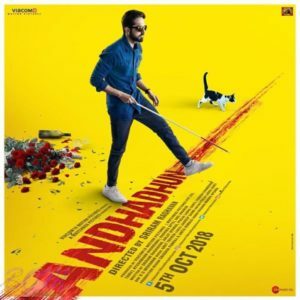 The album itself rounds of with the versions of the first songs mentioned above, however it does get smooth-edged by the title track (Andhadhun Title Track) and Andhadhun Theme 01 and 02. While these can be dealt with together they are wildly different in their styles. The title track is a Raftaar special, with standard club beats and synth mixed under Raftaar’s easy to understand lyrical rap style. The sound is not new to anyone, even with the introduction of a big drum beat after the first chorus, yet it manages to stand out separately within this album and the strong finish with cymbal clash makes for a delectable opening sequence. The theme songs are pure piano, pure melody. No singer, not much for rhythm or beat except for the occasional violin, this is very much about the piano player and the skill they bring. Theme 01 is easy light playing with an occasional high note thrown in to keep audiences listening for something, however this could easily be the backdrop to a gentle stroll in a park. After a minute it starts to add complexity with a new underlying beat in a lower octave and the introduction of the odd bottom note to once again keep the listener guessing. This lasts till about 2:15 as it gets more and more hectic then returning to rest for a full flourish finish glissando, ending is sublime silence. Theme 02 takes on an interesting fusion of what could be ballroom dancing but at the same time is more Chopin’s Etude finding both movement and anger in its few moments. This is a more powerful sound, going up and down the piano scales and even in higher notes seems to speak of darker times with the weight of each note. Andhadhun could be literally translated as ‘blind song’. This could be referring to the song of a blind person or that music is blind. Either way, the album to back this story must achieve both relevance to the themes but also be oblivious to the defects of characters within it. Amit Trivedi has delivered on the second part very well, with the music not being sad or looking towards exposing character’s flaws. However, as to the first part, there are too many songs of the same sound, especially since they are re-versions of each other and it feels like some of the songs are there for the sake of slotting in another song. This may be necessary to get the story from one point to another or just to break things up a bit, but in an album with as many beautiful pure melodies as this one, it makes it hard to like. 15 queries in 0.567 seconds.